From Earth, Wind & Fire’s metaphysical vinyl album covers to the holographic CD covers of No Limit Records’ prime, cover art is in fact real art, and its impact can often be more (or less) influential than the artist intended. Run-D.M.C.’s sleeve for the “Walk This Way” 12” (Def Jam) is the perfect example of a cover that means more than it appears to. Straightforward in its art direction, this cover is a snap of music history. The year 1986 was a good one for Run-D.M.C. The NYC trio from Hollis, Queens — Joseph “Rev. Run” Simmons, Darryl “D.M.C.” McDaniels and Jason “Jam Master Jay” Mizell were on top of the world and the music charts with the release of their third album, the triple-platinum Raising Hell. 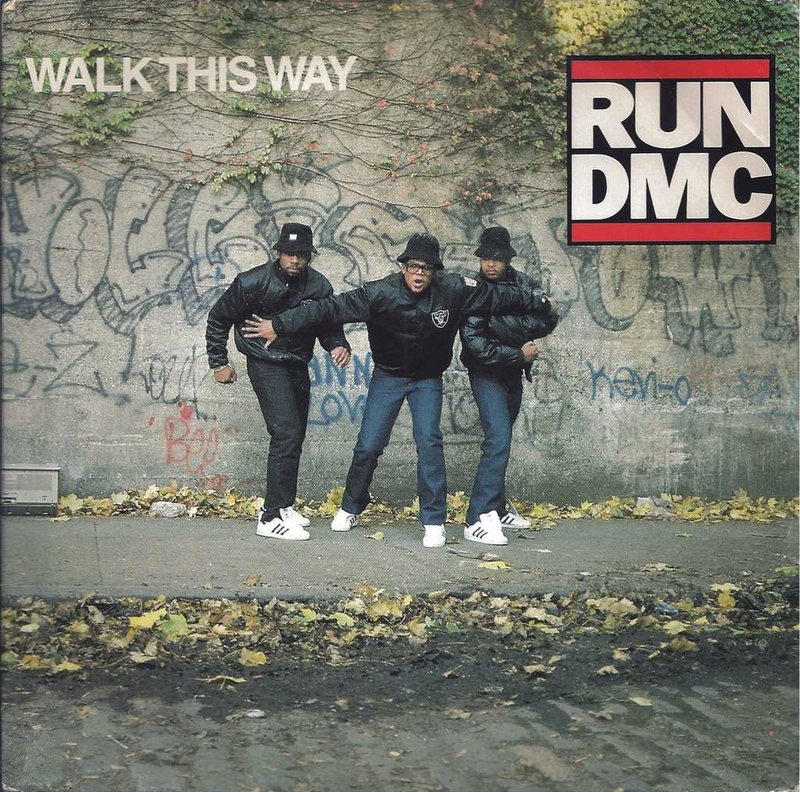 “My Adidas,” the stomping debut single, set the tone for the album’s second, “Walk This Way” the one that transported hip-hop into mainstream consciousness. The song, a collaboration with Aerosmith, and produced by Rick Rubin and Russell Simmons, was an international hit, and peaked at No. 4 on the Billboard’s pop singles chart. But it was about way more than that — rock and rap existed beautifully together — and the three guys on the vinyl single looked like, But of course it did. Cameron White is a product designer in Austin, Texas. He also serves as social media fellow for HRDCVR. Previously, Cam was at NiceKicks.com.